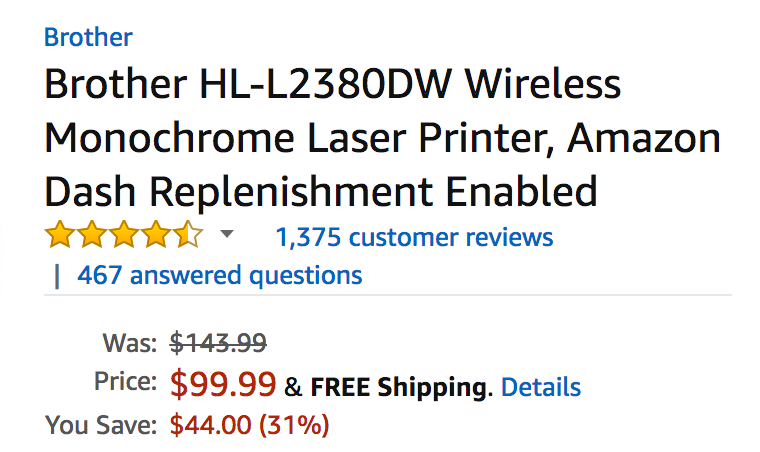 Amazon offers the Brother HL-L2380DW Wireless Laser Printer with AirPrint for $99.99 shipped. Also at Office Depot. That’s a 50% discount off the original MSRP, down $30-40 from most online retailers and the best offer currently available. Rated 4.4/5 stars by over 1,300 reviewers at Amazon where it is the #2 best-selling printer. The Brother HL-L2380DW is a fast, reliable monochrome laser printer designed squarely with the Small Office and Home Office (SOHO) user in mind. Its compact, desk-friendly size is ideal for smaller offices where working space is at a premium, and it prints sharp, professional black and white pages at up to 2400 x 600dpi resolution. It offers convenient walk-up copying and scanning, so it’s ideal for the small office that has the occasional need to digitize or duplicate documents. Thanks to its fast print speed of up to 32ppm, and automatic duplex printing, it’s ideal for printing business documents including multi-page reports, spreadsheets, invoices, and more.